Tech Sgt. N. Alicia Halla | 176th Wing Public Affairs Oct 10, 2018. 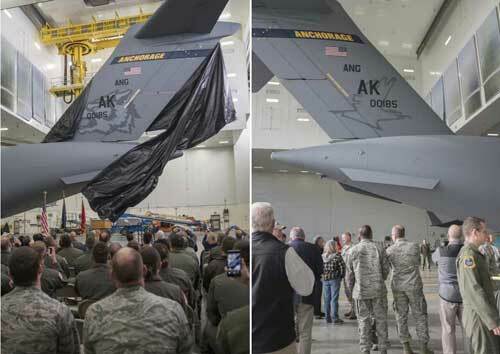 JOINT BASE ELMENDORF-RICHARDSON, Alaska — Members of the Alaska Air National Guard’s 176th Wing and the active duty Air Force’s 3rd Wing witnessed the unveiling of a new tail flash here Oct. 1 on the C-17 Globemaster IIIs assigned to the 176th Wing’s 144th Airlift Squadron. Current and former 144th AS Airmen took a moment to reflect on their history and future together with their associate unit, the 517th Airlift Squadron, whose active duty Air Force aircrews also fly the Alaska Air National Guard’s eight-ship C-17 fleet. “The occasion of the unveiling of a new tail flash [is] one that represents a… joining of forces of the 144th and the 517th Airlift Squadron(s) under one new tail flash — a tail flash representing the heritage of both and the future of the same,” said Chaplain (Maj.) Brad Burns, the 176th Wing head chaplain, during the ceremony invocation. Although the C-17 association between the Alaska Air National Guard and Regular Air Force was established in 2009, the 144th AS’s active-association total-force integration with the 517th is new as of August 2018 when the squadron assumed responsibility for the C-17 mission. The new tail flash depicts a wolf head, (the 144th AS’s emblem), on one side, and a firebird (the 517th AS’s emblem), of equal size on the other. In addition, the yellow tail stripe with “ANCHORAGE” across it links to the first C-130H Hercules’ assigned to the 176th Wing. Many details go into developing a tail flash, from color schemes and size to general impression and effect to morale. Lt. Col. Kirk Palmberg, commander of the 144th AS, said 144th wolf pack members can look to the next chapter of the squadron’s life.